[S5] Kellie Loop, miscellaneous papers, above p. 10 (naming Luther T. Mitchell as his father). [S961] Find A Grave, online at http://www.findagrave.com, memorial for Roy Lee Mitchell, memorial no. 84935992, viewed on 1 Dec 2014 (naming Luther Mitchell as his father). [S5] Kellie Loop, miscellaneous papers, above p. 10 (naming Luther Mitchell as his father). [S5] Kellie Loop, Rice, Tex., miscellaneous papers, p. 10 (naming Luther T. Mitchell as his father). Miss Loop collected family data for decades, probably from the 1930s to the 1970s. Some of it is in her handwriting, and much of it appears to have been written by others and sent to her, but very little of it contains source attribution. There are inconsistencies within the papers. In 1974 the papers were in the possession of Roger Bartlett, Austin, Tex., who assigned the page numbers for ease of reference. [S5] Kellie Loop, miscellaneous papers, above p. 10. [S961] Find A Grave, online, above, memorial for Roy Lee Mitchell, memorial no. 84935992, viewed on 1 Dec 2014 (naming Rosella Claycomb as his mother). [S961] Find A Grave, online, above, memorial for Roy Lee Mitchell, memorial no. 84935992, viewed on 1 Dec 2014. Other Names*: Robert Mitchell, Tobye Mitchell, Toby Mitchell, Robert Milton Ogg, Robert Ogg, Tobye Ogg, Toby Ogg. [S5] Kellie Loop, Rice, Tex., miscellaneous papers, p. 10 (naming Luther Mitchell as his father). Miss Loop collected family data for decades, probably from the 1930s to the 1970s. Some of it is in her handwriting, and much of it appears to have been written by others and sent to her, but very little of it contains source attribution. There are inconsistencies within the papers. In 1974 the papers were in the possession of Roger Bartlett, Austin, Tex., who assigned the page numbers for ease of reference. [S961] Find A Grave, online at http://www.findagrave.com, memorial for Roy Lee Mitchell, memorial no. 84935992, viewed on 1 Dec 2014. Other Names*: Wilden Ogg, Bill Ogg. [S961] Find A Grave, online at http://www.findagrave.com, memorial for Wilden Lee 'Bill' Ogg, memorial no. 27912019, viewed on 1 Dec 2014. [S5] Kellie Loop, Rice, Tex., miscellaneous papers, p. 10 (naming Roy Robert Claycomb as his father). Miss Loop collected family data for decades, probably from the 1930s to the 1970s. Some of it is in her handwriting, and much of it appears to have been written by others and sent to her, but very little of it contains source attribution. There are inconsistencies within the papers. In 1974 the papers were in the possession of Roger Bartlett, Austin, Tex., who assigned the page numbers for ease of reference. "Funeral services were held Thursday [2 Apr 1959] at 10 a.m. from the Griffin Chapel for Matt Finch Oliphant, 75, retired farmer, Route 1, Chatfield, with burial in the Chatfield cemetery. "The rites were conducted by Rev. Marvin James, pastor of the Chatfield Methodist church. "Oliphant died Tuesday night [31 Apr 1959] in Memorial Hospital. "Surviving are his wife of Chatfield; a brother, L. C. Oliphant, and a half-brother, J. E. Oliphant, both of Dallas; a sister, Mrs. J. M. Harper, El Paso, ant other relatives. [S5] Kellie Loop, Rice, Tex., miscellaneous papers, p. 3 (naming William Landon Oliphant as his father). Miss Loop collected family data for decades, probably from the 1930s to the 1970s. Some of it is in her handwriting, and much of it appears to have been written by others and sent to her, but very little of it contains source attribution. There are inconsistencies within the papers. In 1974 the papers were in the possession of Roger Bartlett, Austin, Tex., who assigned the page numbers for ease of reference. [S443] Will of William W. Loop, dated 4 Nov 1910, Navarro Co., Tex. Probate Minutes, bk. 26, pp. 360-65,(naming Matt F. Oliphant as grandchild of William W. Loop). [S796] Navarro County Cemetery Records, vol. 7 (Corsicana, Tex. : The Navarro County Gen. Soc'y, 1987), New Chatfield Cemetery survey, p. 10. [S796] Navarro County Cemetery Records, vol. 7, above, New Chatfield Cemetery survey, p. 10 (giving the date but not the place). [S1207] Corsicana Daily Sun, Corsicana, Tex., online archive at http://corsicana.newspaperarchive.com, 2 Apr 1959, p. 6, col. 4 (obituary of Matt Finch Oliphant). [S796] Navarro County Cemetery Records, vol. 7, above, New Chatfield Cemetery survey, p. 10 (common marker with Emma L. Oliphant) (not giving the date). [S1207] Corsicana Daily Sun, Corsicana, Tex., online archive, above, 2 Apr 1959, p. 6, col. 4 (obituary of Matt Finch Oliphant) (stating that burial was 2 Apr 1959 in the Chatfield cemetery without specifying it was the new cemetery). [S1207] Corsicana Daily Sun, Corsicana, Tex., online archive, above, 2 Apr 1959, p. 6, col. 4 (reprinted here with consent of the Corsicana Daily Sun). [S5] Kellie Loop, miscellaneous papers, above pp. 3, 16 (first bullet). [S1024] World War I draft registration online, Mat. Finch Oliphant, http://tinyurl.com/y7kj5h65 (second bullet). [S5] Kellie Loop, Rice, Tex., miscellaneous papers, pp. 3, 16. Miss Loop collected family data for decades, probably from the 1930s to the 1970s. Some of it is in her handwriting, and much of it appears to have been written by others and sent to her, but very little of it contains source attribution. There are inconsistencies within the papers. In 1974 the papers were in the possession of Roger Bartlett, Austin, Tex., who assigned the page numbers for ease of reference. [S312] Social Security Death Index, online at http://tinyurl.com/AncestrySSDI, viewed on 26 Dec 2003 (stating that she died in Sep 1967; not naming the place of death but stating that she lived in Chatfield, Tex. when she died). [S796] Navarro County Cemetery Records, vol. 7, above, New Chatfield Cemetery survey, p. 10 (common marker with Matt F. Oliphant). Ben Oliphant's tombstone, Wetumka Cemetery, Wetumka, Okla., courtesy of Danny Chancellor. [S443] Will of William W. Loop, dated 4 Nov 1910, Navarro Co., Tex. Probate Minutes, bk. 26, pp. 360-65,(naming Benj R. Oliphant as grandchild of William W. Loop). [S5] Kellie Loop, miscellaneous papers, above pp. 1-2. [S1237] Danny Chancellor, electronic mail to Roger Bartlett, 9 Mar 2012, attributing information to book 12, p. 597, Hughes County, Oklahoma marriage index. [S11] Index to Texas Death Records (Austin, Tex. : Tex. Dept. of Health, Bur. of Vital Statistics), typescript, 1941-45, vol. 8, p. 3955, file 72181 (giving his middle initial as F). [S5] Kellie Loop, miscellaneous papers, above p. 2. [S5] Kellie Loop, miscellaneous papers, above p. 1 (naming Ben R. Oliphant as his father). [S5] Kellie Loop, miscellaneous papers, above p. 1 (naming Ben R. Oliphant as her father). Other Names*: Fannie Cooper Oliphant, Fannie Oliphant. [S5] Kellie Loop, Rice, Tex., miscellaneous papers, p. 16. Miss Loop collected family data for decades, probably from the 1930s to the 1970s. Some of it is in her handwriting, and much of it appears to have been written by others and sent to her, but very little of it contains source attribution. There are inconsistencies within the papers. In 1974 the papers were in the possession of Roger Bartlett, Austin, Tex., who assigned the page numbers for ease of reference. [S5] Kellie Loop, miscellaneous papers, above p. 1. [S5] Kellie Loop, miscellaneous papers, above p. 1 (naming Fannie Cooper as his mother). [S5] Kellie Loop, miscellaneous papers, above p. 1 (naming Fannie Cooper as her mother). [S5] Kellie Loop, Rice, Tex., miscellaneous papers, p. 1 (naming Ben R. Oliphant as her father). Miss Loop collected family data for decades, probably from the 1930s to the 1970s. Some of it is in her handwriting, and much of it appears to have been written by others and sent to her, but very little of it contains source attribution. There are inconsistencies within the papers. In 1974 the papers were in the possession of Roger Bartlett, Austin, Tex., who assigned the page numbers for ease of reference. Other Names*: Lillie Barlow, Lillie Dolph Barlow Oliphant, Lillie Barlow Oliphant, Lillie Dolph Oliphant, Lillie Oliphant. [S5] Kellie Loop, miscellaneous papers, above p. 1 (naming Lillie Dolph Barlow as his mother). [S5] Kellie Loop, miscellaneous papers, above p. 1 (naming Lillie Dolph Barlow as her mother). [S5] Kellie Loop, Rice, Tex., miscellaneous papers, p. 1 (naming Ben R. Oliphant as his father). Miss Loop collected family data for decades, probably from the 1930s to the 1970s. Some of it is in her handwriting, and much of it appears to have been written by others and sent to her, but very little of it contains source attribution. There are inconsistencies within the papers. In 1974 the papers were in the possession of Roger Bartlett, Austin, Tex., who assigned the page numbers for ease of reference. [S312] Social Security Death Index, online at http://tinyurl.com/AncestrySSDI, viewed on 30 Mar 1998 (not naming the place of death but stating that he lived in Holdenville, Oklahoma when he died). [S5] Kellie Loop, miscellaneous papers, above p. 1 (stating that they married in 1937). 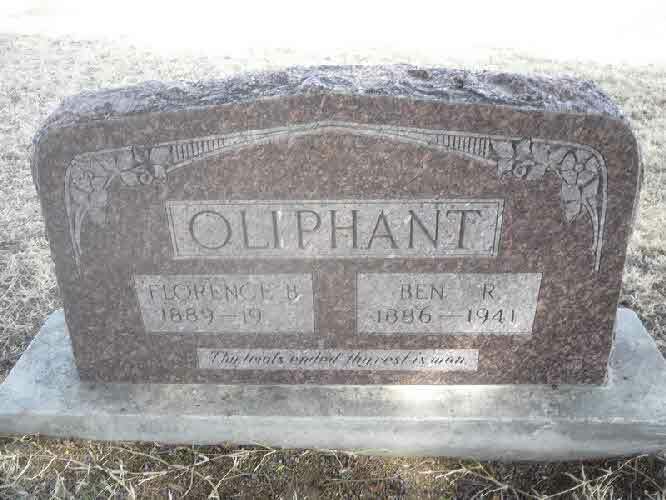 [S961] Find A Grave, online at http://www.findagrave.com, memorial for Florence B. Oliphant, memorial no. 66972002. [S5] Kellie Loop, Rice, Tex., miscellaneous papers, p. 2. Miss Loop collected family data for decades, probably from the 1930s to the 1970s. Some of it is in her handwriting, and much of it appears to have been written by others and sent to her, but very little of it contains source attribution. There are inconsistencies within the papers. In 1974 the papers were in the possession of Roger Bartlett, Austin, Tex., who assigned the page numbers for ease of reference. [S443] Will of William W. Loop, dated 4 Nov 1910, Navarro Co., Tex. Probate Minutes, bk. 26, pp. 360-65,(naming Addie H. Harper as grandchild of William W. Loop). [S733] Francie Herring, 27 Mar 2002 family group sheet, above (naming Melissa Ann Loop as her mother). [S5] Kellie Loop, miscellaneous papers, above pp. 3, 16 (giving the date but not naming the place). [S796] Navarro County Cemetery Records, vol. 7 (Corsicana, Tex. : The Navarro County Gen. Soc'y, 1987), New Chatfield Cemetery survey, p. 11 (giving the date but not naming the place). [S5] Kellie Loop, miscellaneous papers, above pp. 3, 16 (giving the date but not the place). [S18] Rice Rustler, Rice, Tex., 10 Aug 1906, p. 1, col. 2 (giving the date but not the place). [S733] Francie Herring, 27 Mar 2002 family group sheet, above (stating that they were married in the Methodist Church in Chatfield, Texas on 5 Aug 1906). [S31] Navarro Leaves and Branches, vol. 29, no. 3 (Aug 2006), p. 9 (citing Navarro County, Tex. Marriage Records, bk. XVI, p. 191). [S796] Navarro County Cemetery Records, vol. 7, above, New Chatfield Cemetery survey, p. 11 (common marker with Jesse M. Harper). [S18] Rice Rustler, Rice, Tex., 10 Aug 1906, p. 1, col. 2. [S5] Kellie Loop, miscellaneous papers, above p. 3 (naming Addie Mae Oliphant Harper as his mother). [S733] Francie Herring, 27 Mar 2002 family group sheet, above (naming Addie Mae Oliphant as his mother). [S5] Kellie Loop, miscellaneous papers, above p. 3 (naming Addie Mae Harper as his mother). [S5] Kellie Loop, miscellaneous papers, above p. 3 (naming Addie Mae Oliphant as her mother). [S733] Francie Herring, 27 Mar 2002 family group sheet, above (naming Addie Mae Oliphant as her mother). Funeral services for Jesse M. Harper, 83, life-long resident of Chatfield and Rice, were held Wednesday [27 Mar 1957] at 11 a.m. From the McCammon Chapel. Burial was in the new Chatfield cemetery. The rites were conducted by Rev. Joel Daniels, pastor of the Haynie Memorial Methodist Church at Rice. Harper died of a heart attack at his home in Rice early Monday night [25 Mar 1957]. Surviving are his wife of Rice; a daughter, Mrs. Grady Wilson, Sanderson; two sons, John M. Harper, El Paso, and Nugent Harper, Clyde; six grandchildren; four brothers, John Harper, Longview; Joe Harper, Gilmer; Bob Harper, Dallas, and Sid Harper, Channelview; two sisters, Mrs. C. B. Knight, Ennis, and Mrs. J. E. Mizell, Chatfield; and a number of other relatives. Note*: He operated the Koto Klub, a domino parlor, in Rice, Texas. [S733] Francie Herring, family group sheet provided to Roger Bartlett, 27 Mar 2002 (naming John Marion Harper as his father). [S733] Francie Herring, 27 Mar 2002 family group sheet, above (naming Rebecca Jane Alexander as his mother). [S5] Kellie Loop, Rice, Tex., miscellaneous papers, pp. 3, 16 (giving the date but not naming the place). Miss Loop collected family data for decades, probably from the 1930s to the 1970s. Some of it is in her handwriting, and much of it appears to have been written by others and sent to her, but very little of it contains source attribution. There are inconsistencies within the papers. In 1974 the papers were in the possession of Roger Bartlett, Austin, Tex., who assigned the page numbers for ease of reference. [S11] Index to Texas Death Records (Austin, Tex. : Tex. Dept. of Health, Bur. of Vital Statistics), typescript, 1957, vol. 2, p. 540, file 15808 (giving the date and naming the county but not the town). [S1207] Corsicana Daily Sun, Corsicana, Tex., online archive at http://corsicana.newspaperarchive.com, 27 Mar 1957, p. 5, col. 7 (obituary of Jesse M. Harper) (stating that he died of a heart attack in the early evening). [S796] Navarro County Cemetery Records, vol. 7, above, New Chatfield Cemetery survey, p. 11 (common marker with Addie Mae Harper). [S1207] Corsicana Daily Sun, Corsicana, Tex., online archive, above, 27 Mar 1957, p. 5, col. 7 (obituary of Jesse M. Harper). [S1207] Corsicana Daily Sun, Corsicana, Tex., online archive, above, 27 Mar 1957, p. 5, col. 7 (reprinted here with consent of the Corsicana Daily Sun]). [S5] Kellie Loop, miscellaneous papers, above p. 3 (naming Jesse Marion Harper as his father). [S733] Francie Herring, 27 Mar 2002 family group sheet, above (naming Jesse Marion Harper as his father). [S5] Kellie Loop, miscellaneous papers, above p. 3 (naming Jesse Marion Harper as her father). [S733] Francie Herring, 27 Mar 2002 family group sheet, above (naming Jesse Marion Harper as her father). [S5] Kellie Loop, Rice, Tex., miscellaneous papers, p. 3 (naming Jesse Marion Harper as his father). Miss Loop collected family data for decades, probably from the 1930s to the 1970s. Some of it is in her handwriting, and much of it appears to have been written by others and sent to her, but very little of it contains source attribution. There are inconsistencies within the papers. In 1974 the papers were in the possession of Roger Bartlett, Austin, Tex., who assigned the page numbers for ease of reference. [S733] Francie Herring, family group sheet provided to Roger Bartlett, 27 Mar 2002 (naming Jesse Marion Harper as his father). [S5] Kellie Loop, miscellaneous papers, above pp. 3, 16 (giving only the date). [S137] Index to Texas Delayed Probate Birth Records (Austin, Tex. : Tex. Dept. of Health, Bur. of Vital Statistics), vol. 15, p. 7443, file 28453. [S312] Social Security Death Index, online at http://tinyurl.com/AncestrySSDI, viewed on 12 Mar 1998 (giving only the date). [S312] Social Security Death Index, online at http://tinyurl.com/AncestrySSDI, viewed on 12 Mar 1998 (not naming the place of death but stating that he lived in El Paso, Texas when he died). [S312] Social Security Death Index, online at http://tinyurl.com/AncestrySSDI, viewed on 27 Sep 2002 (giving his name as Newt O. Harper). [S11] Index to Texas Death Records (Austin, Tex. : Tex. Dept. of Health, Bur. of Vital Statistics), typescript, 1994. [S733] Francie Herring, 27 Mar 2002 family group sheet, above (giving his name as Newt Harper). [S11] Index to Texas Death Records, typescript, above, 1994 (stating that he died on 20 Dec 1994 in Kerr Co., Tex.). [S312] Social Security Death Index, online at http://tinyurl.com/AncestrySSDI, viewed on 27 Sep 2002 (stating that he died on 15 Dec 1994 without naming the place). [S733] Francie Herring, 27 Mar 2002 family group sheet, above (stating that he died on 21 Dec 1994 without naming the place). Other Names*: Marjorie Harper, Marjorie Ann Harper Wilson, Marjorie Ann Wilson, Marjorie Wilson, Marjorie Harper Wilson. [S5] Kellie Loop, Rice, Tex., miscellaneous papers, p. 3 (naming Jesse Marion Harper as her father). Miss Loop collected family data for decades, probably from the 1930s to the 1970s. Some of it is in her handwriting, and much of it appears to have been written by others and sent to her, but very little of it contains source attribution. There are inconsistencies within the papers. In 1974 the papers were in the possession of Roger Bartlett, Austin, Tex., who assigned the page numbers for ease of reference. [S733] Francie Herring, family group sheet provided to Roger Bartlett, 27 Mar 2002 (naming Jesse Marion Harper as her father). [S961] Find A Grave, online at http://www.findagrave.com, memorial for Marjorie Ann Harper Wilson, memorial no. 46422658, viewed on 20 Dec 2012. [S961] Find A Grave, online, above, memorial for Grady Cade Wilson, memorial no. 54983976, viewed on 20 Dec 2012 (not giving the date or place). [S961] Find A Grave, online, above, memorial for Marjorie Ann Harper Wilson, memorial no. 46422658, viewed on 20 Dec 2012 (not giving the date or place). [S5] Kellie Loop, miscellaneous papers, above p. 6 (naming Marjorie Harper as her mother). [S1248] Obituary of Francie Ruth Wilson Herring, on web site of Phillips & Luckey Funeral Home, Rockdale, Tex., at http://tinyurl.com/cv5k5yp, viewed on 17 Dec 2012 (naming Marjorie Ann Harper as her mother). [S5] Kellie Loop, Rice, Tex., miscellaneous papers, pp. 3, 16 (giving the date but not the place). Miss Loop collected family data for decades, probably from the 1930s to the 1970s. Some of it is in her handwriting, and much of it appears to have been written by others and sent to her, but very little of it contains source attribution. There are inconsistencies within the papers. In 1974 the papers were in the possession of Roger Bartlett, Austin, Tex., who assigned the page numbers for ease of reference. [S961] Find A Grave, online at http://www.findagrave.com, memorial for Grady Cade Wilson, memorial no. 54983976, viewed on 20 Dec 2012. [S443] Will of William W. Loop, dated 4 Nov 1910, Navarro Co., Tex. Probate Minutes, bk. 26, pp. 360-65,(naming Nugent Oliphant as grandson of William W. Loop). [S386] Unidentified newspaper clipping in possession of Roger Bartlett, (obituary of L. Nugent Oliphant, Sr.). [S961] Find A Grave, online at http://www.findagrave.com, memorial for Luther Nugent Oliphant, memorial no. 30405564, viewed on 28 Jun 2012. [S5] Kellie Loop, miscellaneous papers, above pp. 3 (not giving the date), 16 (giving the date as circa 1915). [S5] Kellie Loop, miscellaneous papers, above pp. 4, 16. [S386] Unidentified newspaper clipping in possession of Roger Bartlett, (obituary of L. Nugent Oliphant, Sr.; not giving her original name or the date but stating that he was survived by his wife, Grace). [S312] Social Security Death Index, online at http://tinyurl.com/AncestrySSDI, viewed on 30 Mar 1998 (stating that he died in Dec 1982; not naming the place of death but stating that he lived in Dallas, Texas when he died). [S386] Unidentified newspaper clipping in possession of Roger Bartlett, (obituary of L. Nugent Oliphant, Sr., stating that he died at his home). [S5] Kellie Loop, miscellaneous papers, above pp. 3, 16 (date only). [S11] Index to Texas Death Records (Austin, Tex. : Tex. Dept. of Health, Bur. of Vital Statistics), typescript, 1903-40, vol. 38, p. 18784, file 5573 (giving her name as Sara). Note*: He was granted an agricultural deferment during World War II. [S121] Grave marker, New Cemetery, Chatfield, Texas. [S312] Social Security Death Index, online at http://tinyurl.com/AncestrySSDI, viewed on 26 Mar 1998 (giving his name as R. Montfort; not naming the place of death but stating that he lived in Corsicana, Texas when he died). [S121] Grave marker, New Cemetery, Chatfield, Texas (giving the date but not the place). [S1559] Texas Death Index, 1964-1998, online at https://www.familysearch.org, record for Robert Earl Montfort, viewed on 25 Jan 2019. Other Names*: Grace Rains, Grace Lealma Rains Oliphant, Grace Lealma Oliphant, Grace Rains Oliphant, Grace Oliphant. [S67] The Dallas Morning News, Dallas, Tex., 17 Oct 2002 (obituary of Grace Lealma Oliphant) (naming Isaac Tildon Rains as her father). [S67] The Dallas Morning News, Dallas, Tex., 17 Oct 2002 (obituary of Grace Lealma Oliphant) (naming Irrah Pearl Hicks as her mother). [S5] Kellie Loop, Rice, Tex., miscellaneous papers, pp. 4, 16 (stating that she was born on 21 Jun 1908 without naming the place). Miss Loop collected family data for decades, probably from the 1930s to the 1970s. Some of it is in her handwriting, and much of it appears to have been written by others and sent to her, but very little of it contains source attribution. There are inconsistencies within the papers. In 1974 the papers were in the possession of Roger Bartlett, Austin, Tex., who assigned the page numbers for ease of reference. [S67] The Dallas Morning News, Dallas, Tex., 17 Oct 2002 (obituary of Grace Lealma Oliphant). [S312] Social Security Death Index, online at http://tinyurl.com/AncestrySSDI, viewed on 26 Dec 2003 (not naming the place of death but stating that she lived in Eunice, La. when she died). [S67] The Dallas Morning News, Dallas, Tex., 17 Oct 2002. [S1] Ruth Bennett, Naudain Family of Delaware (Geneva, Neb. : n.pub., 1941), p. 66 (giving the date but not the place). This material is a typescript of "notes" in Ms. Bennett's possession and apparently was originally written and compiled by James W. Lattomus. Copies are with the D.A.R. Library, Washington, D.C., and Roger Bartlett, Austin, Tex., and can be viewed at http://www.rabgenealogy.com/ui53.htm. The notes contain some inconsistencies, and page 45 was missing from the D.A.R. Library copy when it was copied. [S527] Naudain Family Record, (giving her name as Henretta Bales). These four loose pages are believed to have been copied from a bible of James Nelson Naudain and Ellen Grose Naudain. Apparently the copy was first made by Ellen Loop Garner, who referred to it as "grandfather's family record." Kellie Loop provided a copy of it to Roger Bartlett in 1974. [S191] San Saba News, San Saba, Tex., 25 Dec 1880. [S1] Ruth Bennett, Naudain Family of Delaware (Geneva, Neb. : n.pub., 1941), p.66 (naming James Nelson Naudain as her father). This material is a typescript of "notes" in Ms. Bennett's possession and apparently was originally written and compiled by James W. Lattomus. Copies are with the D.A.R. Library, Washington, D.C., and Roger Bartlett, Austin, Tex., and can be viewed at http://www.rabgenealogy.com/ui53.htm. The notes contain some inconsistencies, and page 45 was missing from the D.A.R. Library copy when it was copied. [S1] Ruth Bennett, Naudain Family of Delaware, above, p. 66 (giving only the month and year and stating that she was born and died on the same date). [S527] Naudain Family Record, ("Our Daughter Elen was born 23rd of January 1832--Dide the same night"). These four loose pages are believed to have been copied from a bible of James Nelson Naudain and Ellen Grose Naudain. Apparently the copy was first made by Ellen Loop Garner, who referred to it as "grandfather's family record." Kellie Loop provided a copy of it to Roger Bartlett in 1974. [S1] Ruth Bennett, Naudain Family of Delaware, above, p. 66 (giving only the month and year). [S1] Ruth Bennett, Naudain Family of Delaware (Geneva, Neb. : n.pub., 1941), pp. 66, 85 (giving her name as Rebecca and naming James Nelson Naudain as her father). This material is a typescript of "notes" in Ms. Bennett's possession and apparently was originally written and compiled by James W. Lattomus. Copies are with the D.A.R. Library, Washington, D.C., and Roger Bartlett, Austin, Tex., and can be viewed at http://www.rabgenealogy.com/ui53.htm. The notes contain some inconsistencies, and page 45 was missing from the D.A.R. Library copy when it was copied. [S1] Ruth Bennett, Naudain Family of Delaware, above, pp. 66 (giving her name as Rebecca and giving the date but not the place), 85 (giving her name as Rebecca and giving the date but not the place), 86 (giving her name as Rebecca and giving the place but not the date). [S527] Naudain Family Record, (giving her name as Rebcci and giving only the date). These four loose pages are believed to have been copied from a bible of James Nelson Naudain and Ellen Grose Naudain. Apparently the copy was first made by Ellen Loop Garner, who referred to it as "grandfather's family record." Kellie Loop provided a copy of it to Roger Bartlett in 1974. [S1] Ruth Bennett, Naudain Family of Delaware, above, pp. 66, 85 (giving her name as Rebecca). [S527] Naudain Family Record, above, (spelling her name as Elen Rebeca). [S196] Alma Ward Hamrick, The Call of the San Saba: A History of San Saba County [Texas], 2d ed. (Austin, Tex. : San Felipe Press, Jenkins Publishing Co., 1969), p. 115 (naming Rebecca Naudain as his mother) (reminiscence of John Wesley Dalton). [S195] Lennie D. Tisdale, "John W. Dalton," in San Saba County History 1856-1983 (San Saba, Tex. : San Saba Hist. Commission, 1983), p. 70 (naming "Mrs. John Dalton" as his mother). [S961] Find A Grave, online at http://www.findagrave.com, memorial for J. M. Dalton, memorial no. 64481475, viewed on 20 Jul 2011 (naming Rebeccah Dalton as his mother). John Dalton's tombstone, Center City Cemetery, Center City, Tex., courtesy of Dana Williams. [S1064] R. Shannon McDonald, electronic mail to Roger Bartlett, 27 Feb 2006, (stating that he was the third child of Carter Terrance Dalton and Ester McDonnold). [S1064] R. Shannon McDonald, electronic mail to Roger Bartlett, 27 Feb 2006, (giving the date but not the place). 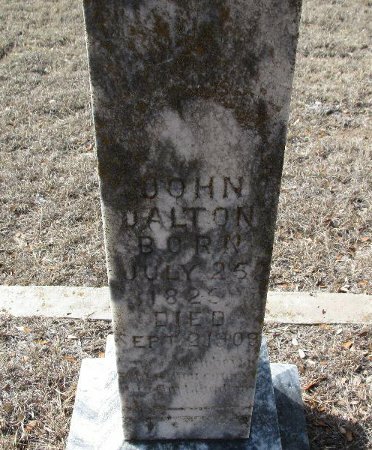 [S961] Find A Grave, online at http://www.findagrave.com, memorial for John Dalton, memorial no. 64481355, viewed on 20 Jul 2011 (giving the date but no other information). [S527] Naudain Family Record, (spelling her name as Elen Rebeca). These four loose pages are believed to have been copied from a bible of James Nelson Naudain and Ellen Grose Naudain. Apparently the copy was first made by Ellen Loop Garner, who referred to it as "grandfather's family record." Kellie Loop provided a copy of it to Roger Bartlett in 1974. [S961] Find A Grave, online, above, memorial for John Dalton, memorial no. 64481355, viewed on 20 Jul 2011. [S196] Alma Ward Hamrick, The Call of the San Saba: A History of San Saba County [Texas], 2d ed. (Austin, Tex. : San Felipe Press, Jenkins Publishing Co., 1969), pp. 115-18 (reminiscence of John Wesley Dalton). [S196] Alma Ward Hamrick, The Call of the San Saba, above, p. 115 (naming John Dalton as his father) (reminiscence of John Wesley Dalton). [S196] Alma Ward Hamrick, The Call of the San Saba, above, p. 115 (naming John Dalton as her father) (reminiscence of John Wesley Dalton). [S961] Find A Grave, online, above, memorial for J. M. Dalton, memorial no. 64481475, viewed on 20 Jul 2011 (naming John Dalton as his father). [S1] Ruth Bennett, Naudain Family of Delaware (Geneva, Neb. : n.pub., 1941), pp. 66, 85 (naming James Nelson Naudain as his father). This material is a typescript of "notes" in Ms. Bennett's possession and apparently was originally written and compiled by James W. Lattomus. Copies are with the D.A.R. Library, Washington, D.C., and Roger Bartlett, Austin, Tex., and can be viewed at http://www.rabgenealogy.com/ui53.htm. The notes contain some inconsistencies, and page 45 was missing from the D.A.R. Library copy when it was copied. [S1] Ruth Bennett, Naudain Family of Delaware, above, pp. 66 (giving only the date), 85 (giving the date and place). [S527] Naudain Family Record, (giving the date but not the place). These four loose pages are believed to have been copied from a bible of James Nelson Naudain and Ellen Grose Naudain. Apparently the copy was first made by Ellen Loop Garner, who referred to it as "grandfather's family record." Kellie Loop provided a copy of it to Roger Bartlett in 1974. [S5] Kellie Loop, Rice, Tex., miscellaneous papers, p. 7 (no date). Miss Loop collected family data for decades, probably from the 1930s to the 1970s. Some of it is in her handwriting, and much of it appears to have been written by others and sent to her, but very little of it contains source attribution. There are inconsistencies within the papers. In 1974 the papers were in the possession of Roger Bartlett, Austin, Tex., who assigned the page numbers for ease of reference. [S1] Ruth Bennett, Naudain Family of Delaware, above, pp. 66 (giving the date but not the place), 85 (giving the date and place). [S527] Naudain Family Record, (giving only the date). These four loose pages are believed to have been copied from a bible of James Nelson Naudain and Ellen Grose Naudain. Apparently the copy was first made by Ellen Loop Garner, who referred to it as "grandfather's family record." Kellie Loop provided a copy of it to Roger Bartlett in 1974. [S527] Naudain Family Record, above, (stating that she and Mary were twins). [S1] Ruth Bennett, Naudain Family of Delaware (Geneva, Neb. : n.pub., 1941), pp. 66, 86 (naming James Nelson Naudain as her father). This material is a typescript of "notes" in Ms. Bennett's possession and apparently was originally written and compiled by James W. Lattomus. Copies are with the D.A.R. Library, Washington, D.C., and Roger Bartlett, Austin, Tex., and can be viewed at http://www.rabgenealogy.com/ui53.htm. The notes contain some inconsistencies, and page 45 was missing from the D.A.R. Library copy when it was copied. [S1] Ruth Bennett, Naudain Family of Delaware, above, pp. 66 (stating that she was born on 31 Jul 1842 without naming the place), 86 (stating that she was born on 3 Feb 1842 near Fieldsboro, Delaware). [S527] Naudain Family Record, above, (giving the date but not the place). [S527] Naudain Family Record, above, (spelling his name as Marida and giving only the date). [S1] Ruth Bennett, Naudain Family of Delaware, above, pp. 66, 86. [S527] Naudain Family Record, above, (stating that she died on 4 May 1887 at age forty-five years). Note*: His name may have been Marida. [S1] Ruth Bennett, Naudain Family of Delaware (Geneva, Neb. : n.pub., 1941), pp. 66 (giving the date but not the place), 86 (giving the date and place). This material is a typescript of "notes" in Ms. Bennett's possession and apparently was originally written and compiled by James W. Lattomus. Copies are with the D.A.R. Library, Washington, D.C., and Roger Bartlett, Austin, Tex., and can be viewed at http://www.rabgenealogy.com/ui53.htm. The notes contain some inconsistencies, and page 45 was missing from the D.A.R. Library copy when it was copied. [S527] Naudain Family Record, (spelling his name as Marida and giving only the date). These four loose pages are believed to have been copied from a bible of James Nelson Naudain and Ellen Grose Naudain. Apparently the copy was first made by Ellen Loop Garner, who referred to it as "grandfather's family record." Kellie Loop provided a copy of it to Roger Bartlett in 1974. [S1] Ruth Bennett, Naudain Family of Delaware, above, p. 86 (indicating that Meredith Etheridge was his father). [S1] Ruth Bennett, Naudain Family of Delaware, above, p. 86 (indicating that Meredith Etheridge was her father).